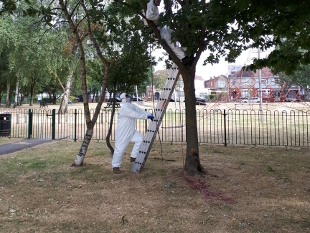 Hounslow Council’s removal programme for the Oak Processionary Moth (OPM) nests has now begun. Over the next two months trained experts from the GreenSpace 360 arboriculture team will be removing the unwelcome OPM nest infestations from several oak trees in the borough. Caterpillars of the OPM are covered in long hairs containing a toxic substance which can cause itchy rashes as well as eye and throat irritations if touched. Residents are reminded not to be alarmed by the presence of the removal team in protective gear which includes coveralls, masks and gloves. The experts are donning the full kit to avoid nasty rashes and, if inhaled, breathing problems caused by the poisonous caterpillars. Those who spot the caterpillars or nests of the moth are asked to report it to the Forestry Commission. Reports of OPM sightings can be directed to the Forestry Commission or call 0300 067 4442.